where did all the feminist dolls go? 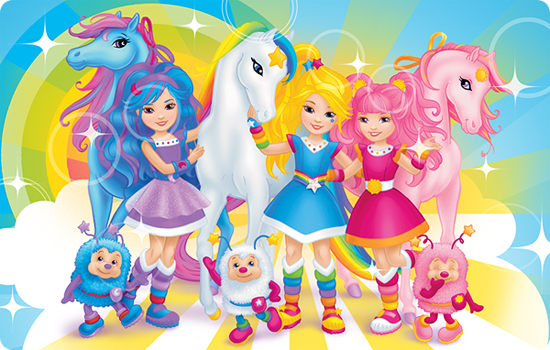 Feminsite blogged on a very scary new development: Rainbow Brite got all revamped to be re-released by Hallmark. I know, this should be a happy thing, right? I went to the new website for Rainbow Brite, and while she isn’t quite the horror show that is posted in the picture on Feministe, the new Rainbow Brite certainly isn’t anything that children can identify with. Like all other popular plastic dolls I’ve seen lately, the new Rainbow Bright is some sort of thin representation of what a little girl should become, if reality TV show producers had their way. If, like Cara from Feministe and myself, you had the Rainbow Bright sheets and dolls you are mourning the loss of your childhood friend who, apparently, has been resurrected form the dead only to be eaten up and puked out by Barbie and the Bratz. Miss Bright, I’ll miss you. They also redid Dora the Explorer and Strawberry Shortcake to make them more tween-like (i.e. more attractive). Disturbing! Okay, first off, I had Rainbow Brite sheets, clothes, videos, birthday cake, dolls, etc. Secondly, I am sickened by this makeover….did she get the Heidi Montag 10 procedure knife special? I mean Barbie already had measurements of unrealistic proportions and that was bad enough…now Strawberry Shortcake and Rainbow Brite? My fingers are crossed that they do NOT get their hands on Jem and the Misfits or She-ra! they’re just TV shows, I don’t live my life by them or aspire to be like any of the characters I see on TV, and I watched all the same shows when I was a kid. I’m 31 years old now, and managed to grow up without any image/eating disorders or any racial prejudice. I think many people have forgotten one of the most important influences in a childs life and that is thoughtful parenting. The TV doesn’t babysit my child, and I make I point to instil the values I think are important in my child everyday. I have a 3 year old daughter and Dora is one of her favorite shows. Other than the fact that I can’t stand the map song, I love Dora, and my daughter is learning a lot of Spanish which I think is terrific. It’s the networks job to sell TV shows and I don’t blame them for that. I pick up the slack where they leave off as far as my child’s world views are concerned because that’s my job.